His accusations came days after a national leader of the party, Asiwaju Bola Tinubu wrote the National Chairman, Chief John Odigie-Oyegun, accusing him of kow-towing to pressure from money-bags. “From all intents and purposes, these issues are orchestrated…you know, the Asiwaju committee was constituted just a few days ago and these issues have been hanging on Cross River state since the appointment of the Minister. The question that you will now ask is how come that immediately after the Asiwaju Bola Tinubu committee was constituted by the president, the National Chairman, the Deputy National Chairman, South and the National Organizing Secretary became so much in a hurry, so much interested and so much aggressive in their attempt to have this all-important chairman that they could not have in more than two years. What is the purpose?” he queried. Explaining the issues in the Cross River chapter, he said; “There was a consensus in the Cross River state chapter that we should have a congress to bring in a substantive chairman since the erstwhile chairman had been appointed as the Minister of Niger Delta Affairs. That was the agreement by the people of Cross River state and based on that, I wrote on behalf of the zone to the National Working Committee NWC to give the zone the authority to conduct a congress to that effect and the NWC said I should liaise with the office of the National Organizing Secretary (headed by Sen. Osita Izunaso) for that purpose. 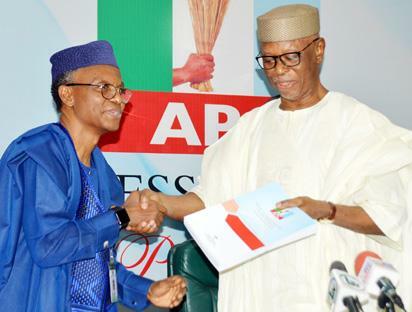 The post APC Crisis Deepens: NWC member accuses colleagues, says, ‘our party, now for the highest bidder’ appeared first on Vanguard News.